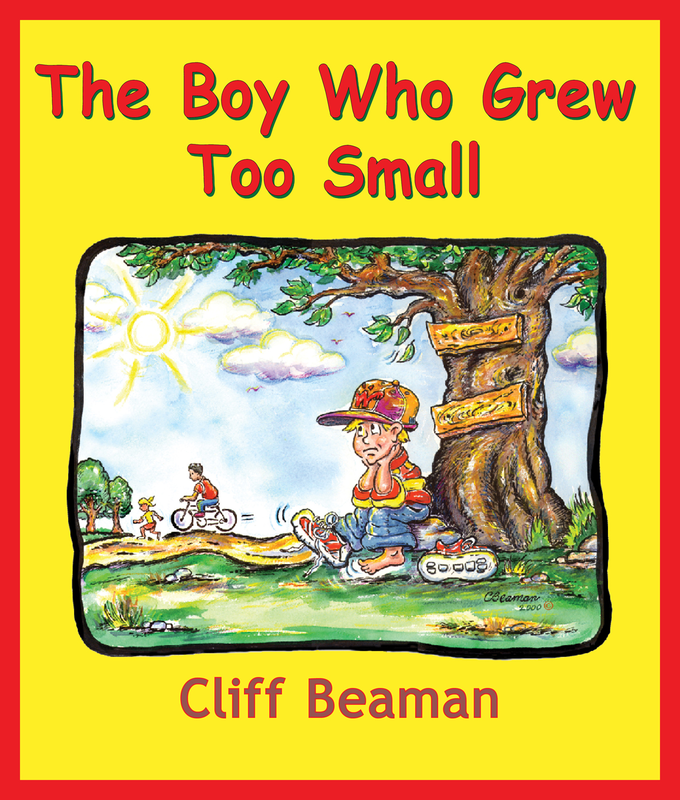 Author Cliff narrates the story of his creating The Boy Who Grew Too Small . . .
One night I dreamed about a boy who started shrinking because he began smoking. Why such a dream, you ask? 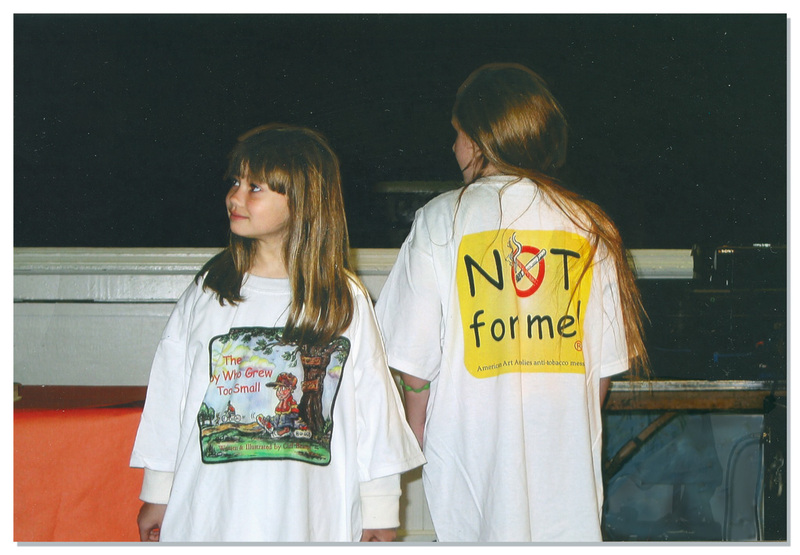 I had just learned that the Florida legislature had won a case against the tobacco companies and was awarded millions to encourage kids not to use tobacco. My dream materialized probably because I hoped legislators would consider using this imagined book and my multi-media show “Choices” I was already presenting in schools. When I reached out to them later, they declined. However, a closed door wasn’t going to stop my dream from becoming a reality. Still in pajamas, I grabbed a pen and a yellow sticky pad on my nightstand and started sketching dozens of images I had seen in my Technicolor dream. “I could see the images but had no idea who all the characters were or what the text would say.” Yet I was determined these images would be transformed into a book one day. 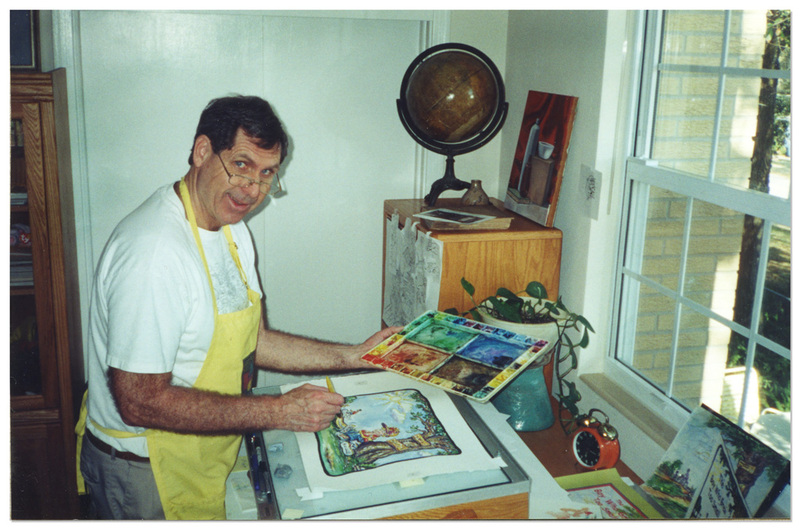 Unfortunately, I had limited time to work on the book because each year I was doing hundreds of multimedia shows in my business, American Art Assemblies. Nevertheless, I began redrawing the scribbly sketches, refining them. The sketches turned into a storyboard on my computer with 10-year-old Jeremy emerging as the main character. 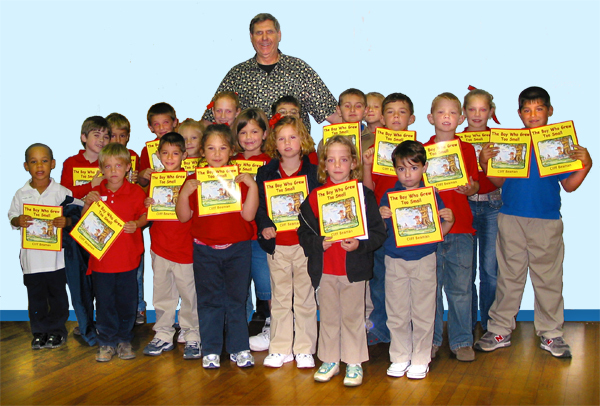 Long before the book was published, a PTA member in a Jacksonville, Florida school contacted me to do a story time. 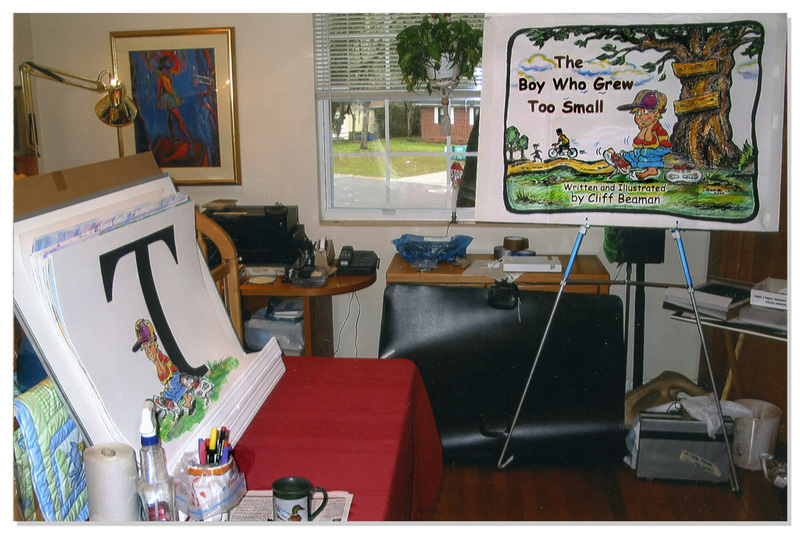 Later on, in these storytelling engagements I used colorful digitized artwork magnified with a school’s LED projector. Over the next several years I added text to the storyboard using a layout program called Canvas. 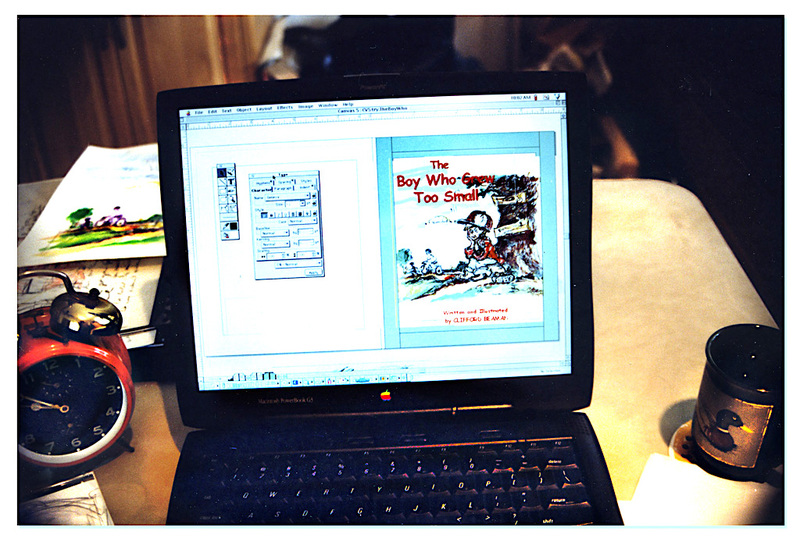 Work on my book was slow-going because I had time only at the end of my workday after the physically demanding shows. Alas, My Book Was Still Not Done . . . I continued many more text revisions, but my book was still not publishable. However, I began the marketing process anyway. So, I designed and sold tee shirts depicting the main character Jeremy sitting under a tree with clothes that nearly swallowed him up. Meanwhile, I trudged on “through the wearisome trenches of editing and revision.” For a few more years, I had former professors, administrators, teachers and school children read my drafts and give suggestions to polish the manuscript. I used the Adobe InDesign application to create my final story with artwork, which then went directly to press: a 52-page children’s book with 36 full-color illustrations that I could hold in my hand. Soon I was signing books at Barnes & Noble, Books-a-Million, Borders, and some independent bookstores. As I continued with my live performances, some schools incorporated book signings along with assembly programs. Since publishing The Boy Who Grew Too Small, I have illustrated two other children’s books, a mythical story The Fisherman, a hardcover book by Joe Andrews and Where Do We Go? 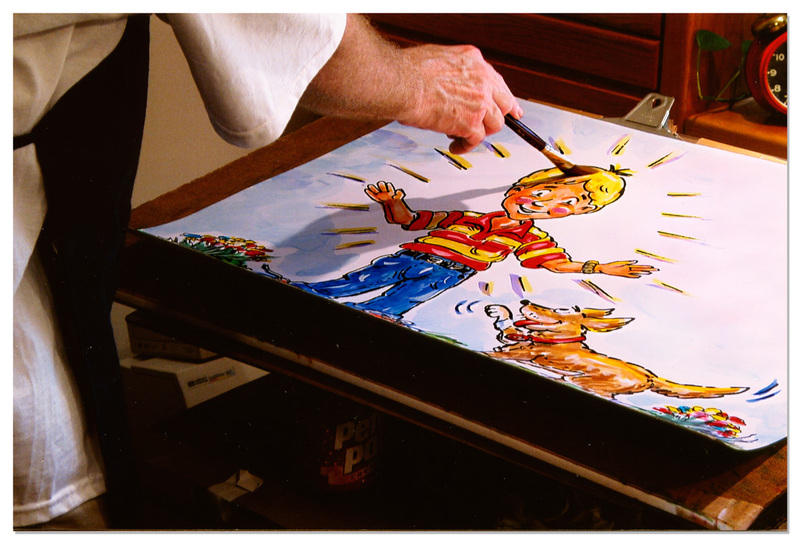 by James Weinsier, a story about loss with a gentle touch. This year Marian and I are collaborating on another book called A Tall Tale, bringing to life one of her blog posts about family roots. 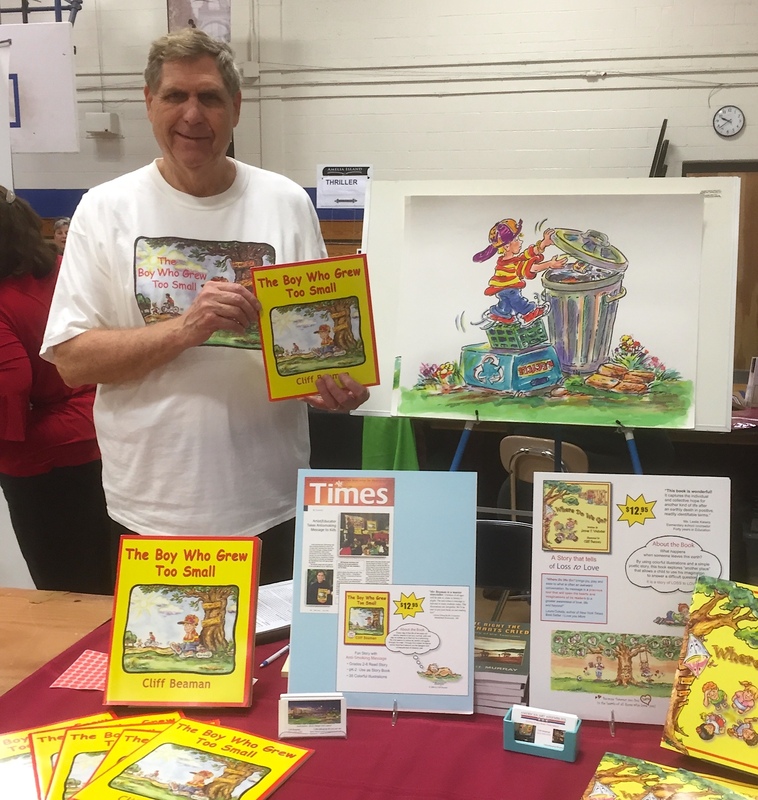 This past weekend (February 2018), Cliff sold books at the Amelia Island Book Festival. Authors in various genres participated, including famed cookbook author Jacques Pépin, world-acclaimed authors David Baldacci and Lee Child of the Jack Reacher thrillers. Grandpa Don buys book for grand-daughter. Glad you and Marian are combining your creative talents, Cliff. I have long enjoyed your contributions to this blog. Congrats on publishing your own book! Congratulations, Cliff! I wish you much success. This is fantastic news! I’ll can wait to read this…you know how much of a fan I am! So exciting! You are so enthusiastic, Jill. You know first hand the excitement of book publication. Cliff wrote and published the book several years ago, but it’s still available. Thanks! Way to go Cliff. A great example of how perseverance pays off. If you have a dream, go for it!! The book looks great and I know how it feels to go to schools and read to the kids. 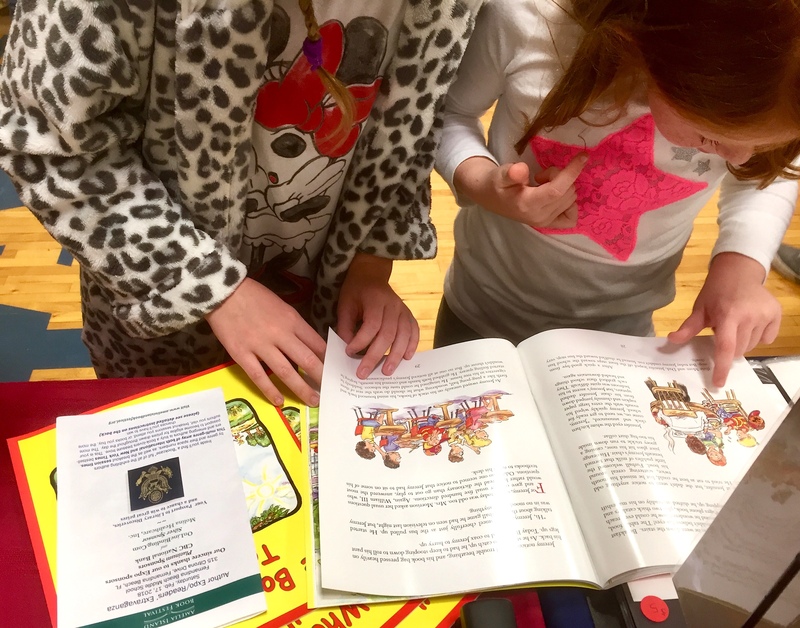 The Amelia Island Book Festival also has an “Authors in Schools” program, which Cliff hopes to participate in during the fall term. You both write for children, but I believe yours are geared to young adult. Actually, I know so because I bought one of your books for our grand-daughter. 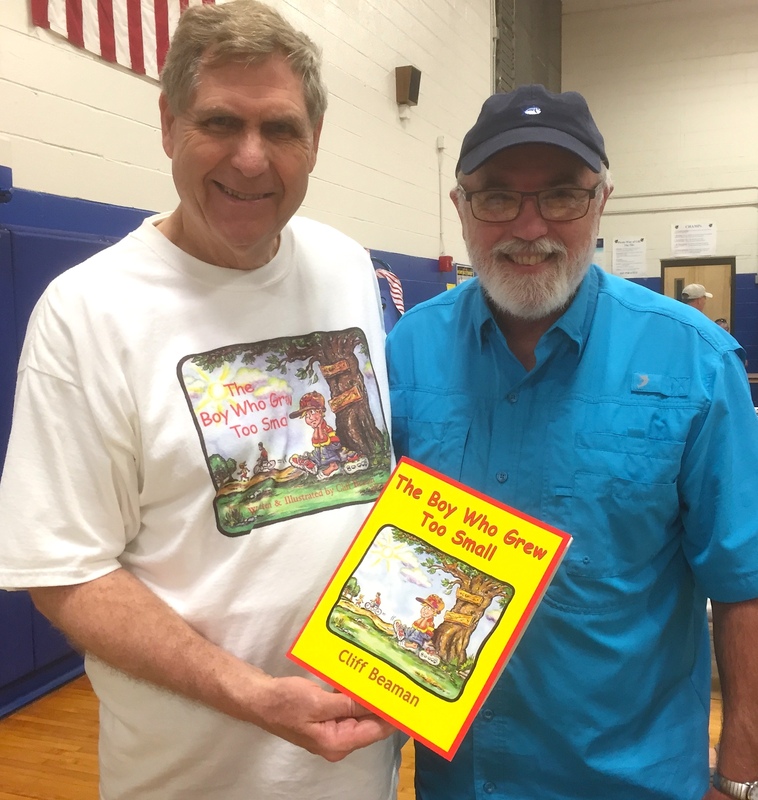 Cliff will enjoy the Book Festival and the kids will enjoy meeting him. My books are for about 8 to 12 years old, what is called middle grade readers or juvenile. (depends on who you talk to) Thanks for buying my book for your granddaughter! Wonderful news! Dreams really do come true! Yes, Marie. I know from one of our recent blog posts you like to explore dreams – and fairy tales. Thanks for reading and commenting here! Praise God for this book. Praying that many children read it and stay away from smoking. Cliff and Marian you are a wonderful gifted couple and a great inspiration to me, and many more. It’s good to hear from you again, busy as your are with your thriving restaurant. I think your grandchildren (and great-grandchildren?) would enjoy this book. Thank you, Gloria! Wow, you two!! This is a great “Never Give Up,” story. I love your illustrations, Cliff, and look forward to seeing more in your collaboration with Marian! Joan, I remember you mentioned how long it took to write your book, and I am experiencing the same drawn-out process. Fortunately, this author has trod a similar path. Thanks for dropping in today! Wow, that’s awesome. Congrats to Cliff, and to both of you for working on a book together. It also tells me something about your relationship. You are a good team! Good on Cliff for persevering and making his dream come true. I wish you both best of luck with your next joint adventure. Thanks for the kind wishes, Fatima. I enjoy watching you and Peter making dreams come true in your travels. Facebook glimpses, of course. Thank you, Marian. I share some photos on FB as not everyone likes to read blogs, but the real and more detailed records of our journey are still in my travel blog. Yaaaaaaay Cliff! And I’m excited about your collaborative work on A TALL TALE as well. Write On! Thanks,Laurie. Just so you know, not long ago I received your postcard heralding your own July publication of book # 2. Yay to you too! Thanks for the nod here, Susan, and for sharing this link with your son Mike! Congratulations to Cliff on bringing his dream to fruition. It’s a noble mission indeed. Also how wonderful that you and Cliff are combining your creative talents. This post really shows the importance of perseverance in publishing! That sounds like a neat book title, Perseverance in Publishing, Kathy. Because titles cannot be copyrighted (or so I think) that may be your next book. Your blog each week is so full of good writing/publishing tips. Thank you, Liesbet. I’ll pass your kind words on to Cliff. I really appreciate the large format photos on your blog. These vivid images provide much more detail than many posted on the Internet. Your photographs showing Cliff’s creativity are special. What a kind thing to say, Conrad. Cliff started this project years ago, so he had to work his magic with photoshop on a few of the oldest ones. My father would have loved this book; Dad died in 2006, the year this was published. He was fervently anti-tobacco. I can’t wait to see more of the book you’ve worked on together! How neat to collaborate creatively. Just today I looked again at a photo of my mother in the tobacco fields. It illustrates her work ethic but contradicts this book’s message. Strange! The book Cliff and I are creating together will probably have to wait until my memoir is published. The text is still a blog post which hasn’t been blended with his sketches, still rudimentary. Thanks for your kind comment, Melodie! Congratulations, Cliff (and Marian). And how exciting to be working together on a project. I hope you’ll write about your process at some point, Marian. When Woody and I did our textbook, Stuttering, together in the mid 1990s, he likened our process to what the wrens do. Papa flys south, finds the location and builds the nest (Woody wrote the first draft). Then mama flies down, takes one look at it and tears it all apart, but uses the same materials to rebuild it (I edited it). Actually, Cliff, your post reminds me we still must talk about your ideas for my Two Bunnies. Life just keeps rolling along doesn’t it. I’d say I’m approaching the end of the muddy middle now, cranking out revisions a thorough developmental editor has sent me. You told me once that I would miss the pains of writing memoir. I’ll trust that your instincts are correct even though I doubt it right now. Ha! Cliff will read this and perhaps contact you about your Two Bunnies story. Yes, life keeps rolling along. Thanks for rolling with us this week. Janet. I just wrote a three-paragraph response to this, which just disappeared, so again, I probably ‘talked’ too much. So let me just say that I loved every word of this post, and so appreciate Cliff’s process to create a wonderful book. I applaud his acceptance of/and use of his dream to begin his book. I’ve read of so many authors who first dream their creation, then follow through. I think most readers (unless they’re writers) don’t understand how many days/weeks/years it takes to write and publish a high-quality book. And I’m in awe of Cliff’s marketing skills! Congrats all around. So sorry about the “miscarriage”! I hate when that happens, Pamela. Thanks for trying again. Neither of us want to publish drivel. Like fine wine, it takes time. When my friends say, “Are you done yet?” I realize they don’t understand the process. You do though, and multiple times – thanks! No one can accuse us of lacking imagination – ha! Thank you, Fiona. He’ll appreciate your recognition, that’s for sure! A wonderful lesson in perseverance. I love knowing the two of you are creating a book together. We already knew it was a match made in heaven. Your book and captivating images will reflect the sweetness that shines through both of you. Congratulations on pushing through, getting your first book out, and finding places to sell it. With gratitude to you and Marian for sharing your lives and your love. My gratitude is shared with you who push through a most difficult time in your life to pay sweet visits here. Thank you, Elaine. Wow–that story is as impressive as it is inspirational! Congratulations to Cliff on achieving his publishing dream and to YOU, Marian, for undoubtedly being the Muse who inspired him!